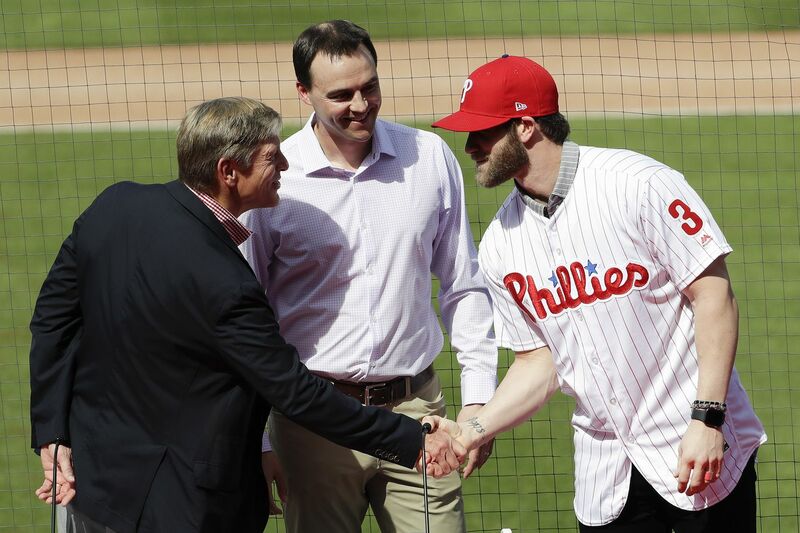 Bryce Harper shakes hands with Phillies owner John Middleton, as general manager Matt Klentak looks on, during an introductory press conference on Saturday in Clearwater. CLEARWATER, Fla. — Negotiations on the largest contract in American sports history didn’t get serious — really, truly serious — until Day 110 of Bryce Harper’s 118-day free agency. Phillies executives visited Harper in his hometown of Las Vegas on Jan. 11. They met again with agent Scott Boras at a Clearwater restaurant on Feb. 12. As promised, Phillies owner John Middleton spent big money for Bryce Harper. And he could keep going. But late in the afternoon of Feb. 20 — one day after another star free agent, Manny Machado, agreed to terms on a 10-year, $300 million deal with the San Diego Padres — Phillies owner John Middleton finally called Boras to initiate contract talks. Boras was ready. But before they got down to business, he had one request. He asked if Middleton would fly back to Vegas to meet with Harper again. This time, though, Boras wanted Middleton to come alone, without any baseball operations personnel. And so it was that Middleton had his George Steinbrenner moment. Two days later, on Feb. 22, he boarded his private jet — the white Bombardier Challenger with the Phillies ‘P’ on the tail — and made a 2,300-mile trip to get his man. Ultimately, it was a record-setting offer — $330 million over 13 years, topping the 13-year, $325 million contract that Giancarlo Stanton signed with the Miami Marlins in 2014 — that put Harper in red pinstripes. The details were ironed out Thursday in a frantic back-and-forth between Boras and Phillies general manager Matt Klentak. But it probably doesn’t happen if not for the bromance that Middleton and Harper developed in only a few days. Harper’s greatest desire in free agency was to sign a long-term contract that will cover the remainder of his career. Once the Nationals chose to allocate their resources in other areas, Harper knew he would be moving on. Still, he wanted to feel a similar bond with the owner of whichever team he chose. John Middleton (left) flew without his personnel, and just his wife Leigh, out to Las Vegas to meet with Bryce Harper and Harper's wife, in mid-February. Boras encouraged Middleton to bring his wife, Leigh, on the recruiting trip. The Middletons touched down on Feb. 22 and met Harper, his wife, Kayla, and Boras for dinner at a high-end Italian restaurant on the Las Vegas strip. For nearly four hours, they discussed baseball and the experience of playing in Philadelphia. But they also talked about life. Middleton told stories from his wrestling career at Amherst College and shared the details of how he and Leigh met. The Harpers were impressed. But they were stunned the next day when the Middletons changed their flight plans because they wanted to have lunch. For three more hours, John and Leigh sat with Bryce and Kayla and talked some more. Middleton has had a stake in the Phillies since 1994 but didn’t become the ownership group’s public face until 2015. His competitive streak has never been much of a secret to people within the organization, though. Jimmy Rollins once dubbed him “Steinbrenner South,” a reference to the late Yankees owner who was known for his desire to win at any cost. It’s a comparison that Middleton embraces. Boras didn’t need for Middleton to tell USA Today that he was willing to “be a little bit stupid” with how much money he spent this winter to know that the Phillies were a strong candidate to give Harper a record-setting contract. Middleton even saved Boras the trouble of giving his sales pitch about how much Harper’s star power could help increase the Phillies’ revenues. It’s all Harper needed to hear. Although Middleton returned to Florida without a deal and Harper caused hysteria in Philadelphia by meeting with the San Francisco Giants and Los Angeles Dodgers last week, the Phillies remained the front-runner. Klentak and Boras haggled over the length of the contract and the average annual value, finally reaching an agreement Thursday. Get insights on the Phillies delivered straight to your inbox with Extra Innings, our newsletter for Phillies fans by Matt Breen, Bob Brookover and Scott Lauber. Click here to sign up.